Robinson, Amanda. 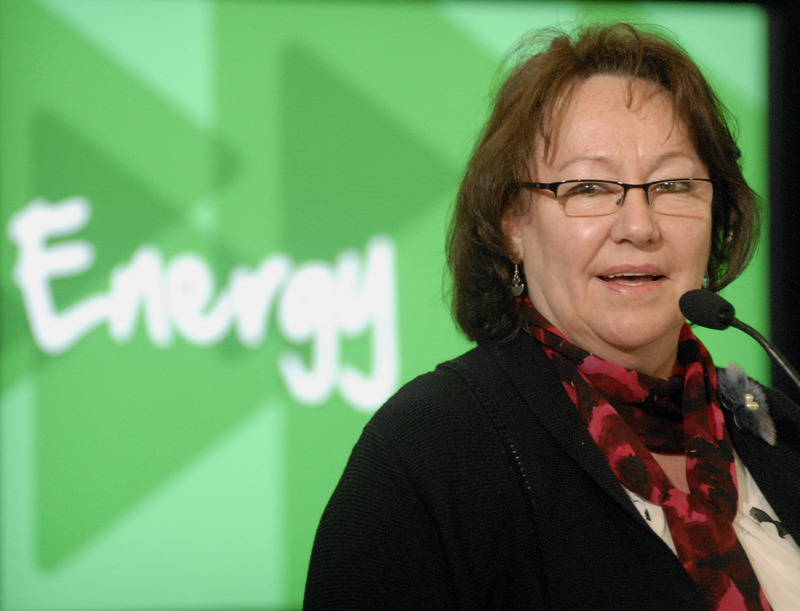 "Sheila Watt-Cloutier ". The Canadian Encyclopedia, 27 June 2017, Historica Canada. https://www.thecanadianencyclopedia.ca/en/article/sheila-watt-cloutier. Accessed 21 April 2019. Sheila Watt-Cloutier (née Watt), OC, human rights and Indigenous rights activist, cultural preservation advocate, politician, writer and educator (born 2 December 1953 in Old Fort Chimo, QC). Watt-Cloutier is a respected Inuit leader who has received international recognition and acclaim in the areas of rights activism, environmental and climate change awareness and social justice. 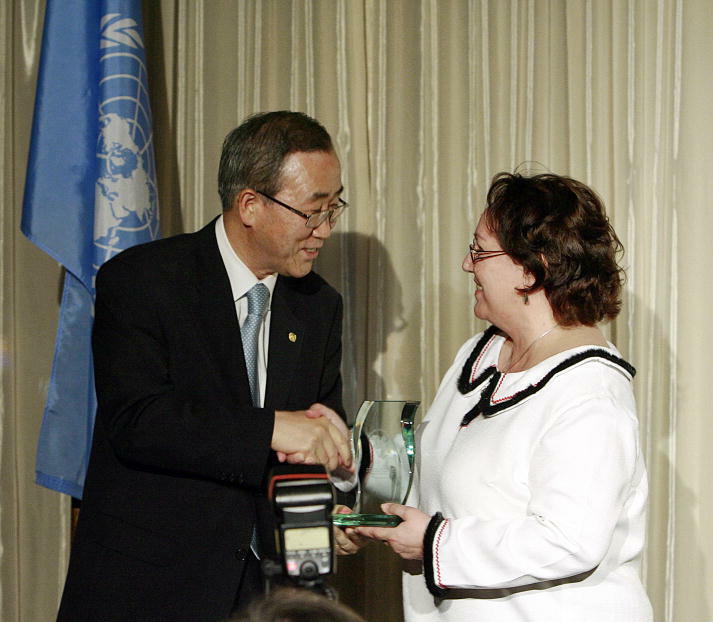 Former UN secretary general Ban Ki-moon (left) presents the 2007 Mahbub ul Haq Award for Excellence in Human Development to Sheila Watt-Cloutier at UN headquarters in New York. Sheila Watt-Cloutier (née Watt) was born into a small and close-knit Inuit community in Nunavik (Northern Québec) in 1953. Her mother, Daisy Watt (1921–2002), was an interpreter, healer and respected Inuit elder. Her father, George Kornelson, was a Qallunaaq (white) man who worked in the North during the 1950s. Watt-Cloutier never met her father as a child. Baptized an Anglican, she attended church and has expressed sentimental connections to church officials who worked in her community. Until she was four years old, Watt-Cloutier’s family lived at the former Hudson’s Bay Company (HBC) trading post known as Old Fort Chimo (now Kuujjuaq). In 1956, the family moved to New Fort Chimo — a former American military base. For the first ten years of her life, Watt-Cloutier was raised by her mother and her maternal grandmother, who worked as a domestic servant for HBC. Watt-Cloutier’s maternal grandfather, William Watt, was a Scottish employee of the HBC. After he was reassigned by the company, he left Watt-Cloutier’s grandmother, mother and other Inuit family members. This was a tragic and disruptive by-product of European Arctic exploration and the colonization of Indigenous populations. Watt-Cloutier has said that being raised by single working women served as a model of resourcefulness. This was particularly challenging in the Arctic, where most people in her community lived by the traditional ice-based ways of the Inuit and therefore depended on an elder male hunter for food. However, the Watt women overcame these circumstances, affording comfortable and dignified lives for their children in a rapidly changing world. As a young Inuit girl, Watt-Cloutier lived by the ways of “snow and ice,” which means that she was trained in the traditional aspects of womanhood, including food and animal preparation and clothing manufacturing. Travelling by dogsled (qamutik) remained the primary source of mobility and sustenance for Arctic families during the 1950s and 1960s, with hunting and ice fishing comprising a significant portion of their living strategies during the prolonged winter and short, mild summers. During her childhood, her people lived in a reality where “everything mattered and everything was connected.” These experiences laid the foundation for her work as a politician, activist and community leader. At the age of 10, Sheila Watt-Cloutier proved an excellent student and was selected by the federal government to partake in an education program in southern Canada. Although she had been away from her Inuit community as a child before (for a hospital stay and while travelling), she had never been away for a prolonged period. Watt-Cloutier has described her move to live with a white family in an isolated Nova Scotia town as traumatic. As a child in a foreign place, she longed for her home, her family and her culture. She persevered by learning English, and she excelled in academics. This came at a high cost, as she lost aspects of her Inuktitut language and her Inuit culture, and began to question her self-identity. When she was 12 years old, government officials moved Watt-Cloutier to Churchill, Manitoba, where she continued her studies at the Churchill Vocational Centre. The school taught gendered vocational skills; girls learned about cooking, domestic tasks and sewing, while boys were taught about welding, mechanics and carpentry. Because of her aptitude for academics, Watt-Cloutier was enrolled in an academic pathway that fostered her advanced learning capabilities. Being that she was also athletic, she participated in extracurricular activities including basketball, volleyball and gymnastics. Watt-Cloutier has said that the adjustment to life in Churchill was eased by the presence of other family members, including her sister, and students from other Indigenous communities. However, these times were not without consequence. While she and her peers became enthralled with North American popular culture of the 1960s, they also were forced to adapt to a “new world order,” which diminished the traditional aspects of the Inuit by introducing them to the cultural ways of “the South.” This fit with federal government policies at the time that sought to assimilate Indigenous peoples (see White Paper, 1969 and Indian Act). After three years at the Churchill Vocational Institute, Watt-Cloutier — by this time a teenager — was selected by the government to attend Gloucester High School in Ottawa, where she experienced homesickness and isolation. Initially, she and her cousin Annie lived with Jake and Ruth Enns, Mennonite pacifists who sheltered American draft dodgers during the Vietnam War. During her second year in Ottawa, she was separated from her cousin. Finally, during her last year of high school, she lived with a family that had ties to her family in Fort Chimo. The tumult of frequent moves yielded academic struggle for Watt-Cloutier. A government counsellor subsequently discouraged her from following her dream of applying to medical school because of her poor math and science grades. At the age of 18, disillusioned and missing home, Watt-Cloutier returned to Fort Chimo. There, she found a community “battered and bruised” by the stark social changes brought about by a move away from traditional living and practices, and increased reliance on technologies including snowmobiles. Upon her return home around 1970, Sheila Watt-Cloutier worked as an interpreter at a local hospital clinic for four years. She enjoyed this role because it facilitated her reacquaintance with Inuktitut and brought renewed connections to her identity as an Inuit woman. During her work at the clinic, she became more conscious of the chronic health problems plaguing her community, including increased rates of family violence and drug and alcohol addiction, as well as a spike in respiratory illnesses, skin infections, gastrointestinal ailments and an alarming spread of viral and bacterial infections. Watt-Cloutier knew that these problems were worsened by poor living conditions and a loss of traditional cultural practices among her people that were once commonplace among the Inuit before trade with Europeans began. As traditional sources of subsistence changed, government initiatives including forced relocation, residential schools and assimilationist policies wreaked havoc in Inuit (and other Indigenous) communities throughout the 20th century. In the Arctic, this was worsened by the collapse of the North American seal skin market in the 1960s, an unfortunate by-product of the interventions of animal rights activists and celebrities, which further threatened the autonomy of Inuit cultural practices. In the spring of 1974, she married Denis Cloutier — a French-Canadian dispatcher whom she had met at the Fort Chimo airport. When her husband was hired by Transport Canada, the couple moved into housing provided by his employer, and welcomed a daughter, Sylvia, and eventually a son, Eric. In 1977, the Watt-Cloutier family moved to Montréal, Québec, where they lived for a few years before moving to nearby St. Eustache. During this time, Sheila worked in the Montréal suburb of Dorval doing administrative work at the head office of the Kativik School Board (KSB), which had been established in 1975 under the James Bay and Northern Québec Agreement (see also Modern Treaties). After living in Montréal and the surrounding area, the family returned to Kuujjuaq. There, Watt-Cloutier helped to establish a committee that set up a childcare facility and playgrounds in the community. She also continued to work for the KSB closer to her community, which expanded her understanding of the complex challenges faced by Inuit families, with social breakdown leading to drug and alcohol abuse, domestic violence and suicide. After returning to Kuujjuaq, Watt-Cloutier began taking courses in student counselling and education offered through McGill University in partnership with the KSB, which shifted her advocacy focus from health to education. She began working full-time at the Jaanimarik School in Kuujjuaq, where she witnessed first-hand the disastrous effect that the breakdown of Indigenous livelihood was having on northern communities and sought to improve this through education reform. The family returned to Montréal, and Watt-Cloutier returned to work at the KSB head office in Dorval as a counsellor for Inuit students in the Québec college system. As the department head for student services, she found that there were not enough staff members to serve a student population that was experiencing acute mental and emotional crisis. Under her direction, the KSB reorganized their residence program to be more supportive of student needs, strategized to have budgets increased and sought to address the pressing issues of alcoholism and addiction among the population being served. Watt-Cloutier’s department advocated for funds from the National Native Alcohol and Drug Abuse Program, and created a rehabilitation program, Isuarsivik, which means “the place where one gains well-being.” Although it provided essential services, the program faltered after only one year as the school board shut down the Montréal-based program. However, this resulted in a stronger screening system for student acceptance into the education program. Despite this setback, the program eventually opened in Kuujjuaq and continues to run under the same name — Isuarsivik. In 1990, Watt-Cloutier was commissioned by the regional health board to study alcohol and substance abuse in northern communities. After the report was completed, Watt-Cloutier was invited to serve as an advisor on an education task force committee and contributed to the production of a document in Inuktitut, English and French: Silatunirmut: The Pathway to Wisdom. This report outlined the weaknesses of the education system, and argued for a system that met community needs of self-government, cultural preservation and an investment in community infrastructure and resources. This initiative, like some of the other critiques Watt-Cloutier had previously articulated about the state of education in the community, was mired in controversy, as disagreements over the best path forward led to conflict between the task force and members of the KSB. The report fueled a heated debate in the community about the future of education in Nunavik. 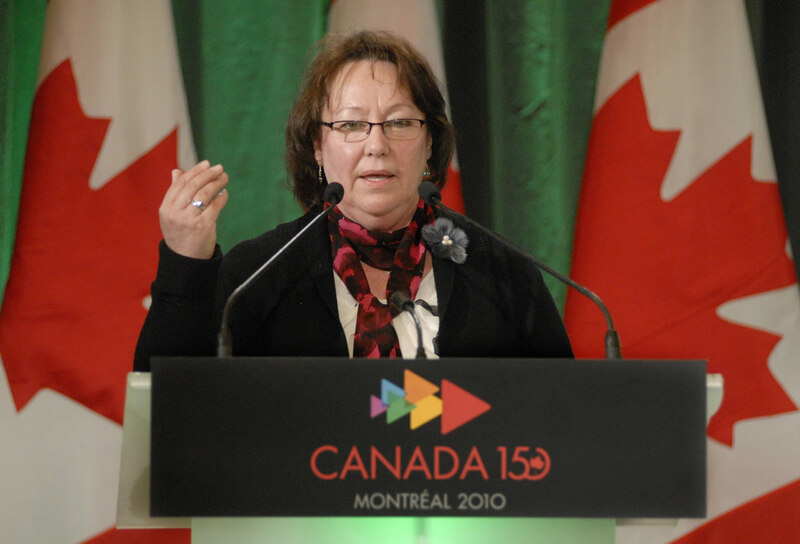 In 1993, Sheila Watt-Cloutier ran for elected office, seeking the position of corporate secretary of the Makivik Corporation, which administered funds from the James Bay and Northern Québec Agreement. Although she lost, this experience renewed her self-confidence as a public speaker and grew her resolve to participate in electoral politics. She went on to be elected corporate secretary for Makivik Corporation in 1995, running on a platform aimed at addressing the social and educational issues facing Nunavik youth. While in this position, Watt-Cloutier oversaw Makivik’s corporate administration. She also participated in the creation of the film Capturing Spirit: The Inuit Journey, which was released in 1998. The film shone a light on the remarkable resilience, yet tragic circumstances, of Inuit communities, who continued to deal with high rates of suicide, addiction and poverty because of a loss of cultural identity and the ongoing effects of colonial trauma. In 1995, Watt-Cloutier was also elected as the Canadian president for the Inuit Circumpolar Council (ICC), a position she held until 2002, when she became the international chair of the ICC. As the international chair, she represented Inuit people in Canada as well as in Greenland, Alaska and Russia. She held this role until 2006. Watt-Cloutier has been an outspoken critic of the use of synthetic chemicals and the negative consequences of these agents on Inuit food supplies and overall health. In 2007, Watt-Cloutier was nominated for a Nobel Peace Prize for her environmental and political activism, particularly on the impacts of climate change on the Inuit people. As a series of resource extraction and development projects took hold in the Arctic in the 1990s and early 2000s, Sheila Watt-Cloutier and her community grappled with a loss of permafrost and ice caps, warmer temperatures, a depleted ozone layer and unpredictable weather patterns. These conditions worsened the decline of traditional avenues of subsistence for Inuit people, and the spread of associated health problems. Watt-Cloutier rose as a vocal critic of the use of persistent organic pollutants (POPs) — toxic remnants of agricultural, waste combustion and manufacturing activities that that do not break down in the environment. Her work with the Inuit Circumpolar Council (ICC) targeted POPs, and highlighted their relationship to climate change and a loss of traditional practices among the Inuit. As scientific consensus began to emerge on the detrimental impacts of POPs to the food chain, the Arctic continued to undergo intense environmental change. The ICC, with Watt-Cloutier as the Canadian president of the organization, acted as a key negotiator of the Stockholm Convention — a 2001 multinational treaty that restricts the use of POPs to reduce the harm they cause to animals, plants and people. In 2000, the International Arctic Science Committee (a non-government organization engaged in Arctic research) and the Arctic Council (a governmental forum with membership by Canada, the United States, Denmark, Finland, Sweden, Iceland, Norway and Russia) began consultation on an Arctic Climate Impact Assessment (ACIA). Watt-Cloutier was an active collaborator on this study, which gathered scientific and traditional information on warming trends in the Arctic. This project was a substantial undertaking, and represented a multilateral partnership between various stakeholders, including the Arctic Council and allied Indigenous groups, the US National Science Foundation and National Ocean and Atmospheric Administration, and the University of Alaska Fairbanks. Following four years of work, including consultation by Indigenous people, the ACIA was presented at the Fourth Arctic Council Ministerial Meeting in Reykjavik, Iceland, in November 2004. Its central findings outlined the rise in annual Arctic temperatures, and showed evidence of widespread glacial and sea ice melting, and documented the implications of global warming for humans, Arctic animals and plant life. As the elected international chair of the ICC from 2002 to 2006, Watt-Cloutier attended all high-level Arctic Council meetings, and was one of the only Indigenous women involved. Having been closely involved in the consultation process for the ACIA, Watt-Cloutier notes that the final document inspired her “for years to come.” Watt-Cloutier expanded on her record of environmental activism by using the ACIA findings to support climate change advocacy in the political arena. In December 2005, she filed a petition related to climate change to the Inter-American Commission on Human Rights (IACHR). This was the world’s first legal action on climate change, and argued that unchecked greenhouse gas emissions that originated from the United States violated Inuit people’s human rights under the 1948 American Declaration of the Rights and Duties of Man. While the IACHR would not hear Watt-Cloutier’s case, the commission did invite her to testify at a hearing on human rights and climate change in March 2007. This helped lay the groundwork for future actions linking global warming with the rights of Indigenous people. A negotiator and political strategist in her own right, Watt-Cloutier and various allies persisted in soliciting nation-states to adopt strategies to reduce greenhouse gas emissions, and lent her voice, energy and expertise to raising the profile of the threat of global warming through advocacy work and education. These efforts contributed to the popular understandings and acceptance of the urgency of climate change in the contemporary period. Sheila Watt-Cloutier published her award-winning book, The Right to be Cold: One Woman’s Story of Protecting Her Culture, the Arctic and the Whole Planet, in 2015. A memoir of her childhood, culture and life, the book also documents the strengths and triumphs of Inuit people as they adapted to a rapidly changing world. The book is a celebrated work of non-fiction, of environmental activism and of human rights. The Right to be Cold has been nominated for significant literary awards, including the BC National Award for Canadian Non-Fiction and the Shaughnessy Cohen Prize for Political Writing. It also made the shortlist for the CBC’s Canada Reads award. Shelia Watt-Cloutier is celebrated for her ability to bring awareness to the threat of climate change and highlight its relationship to human rights and Indigenous rights on a national and international stage, a topic that she has written about widely. Sheila Watt-Cloutier’s work with the Inuit Circumpolar Council contributed to an atmosphere of collaboration and resource sharing for the global Indigenous population, many of whom have experienced increased vulnerability to the critical threat of climate change, habitat destruction and pollution. These processes continue to endanger traditional ways of life, culture and livelihoods throughout Canada and the world. “Honouring our Past, Creating our Future: Education in Northern and Remote Communities,” Aboriginal Education: Fulfilling the Promise (2000). “The Inuit Journey Towards a POPs-Free World,”Northern Lights Against POPs: Combating Toxic Threats in the Arctic (2003). “Climate change and human rights,”Human Rights Dialogue2, No. 11 (2004). “Don’t Abandon the Arctic to Climate Change,”The Globe and Mail (24 May 2006). The Right to be Cold: One Woman’s Story of Protecting her Culture, the Arctic and the Whole Planet (2015). Hari M. Osofsky, “The Inuit Petition as a Bridge? Beyond Dialectics of Climate Change and Indigenous Peoples’ Rights,” American Indian Law Review 31, no. 2 (2006). Marybeth Long Martello, “Arctic Indigenous Peoples as Representations and Representatives of Climate Change,”Social Studies of Science 38, no. 3 (2008). Zoe Todd, “An Indigenous Feminist’s Take on the Ontological Turn: ‘Ontology’ is Just Another Word for Colonialism,” Journal of Historical Sociology 29, no. 1 (2016). Sheila Watt-Cloutier, The Right to be Cold: One Woman’s Story of Protecting Her Culture, the Arctic and the Whole Planet (2015).